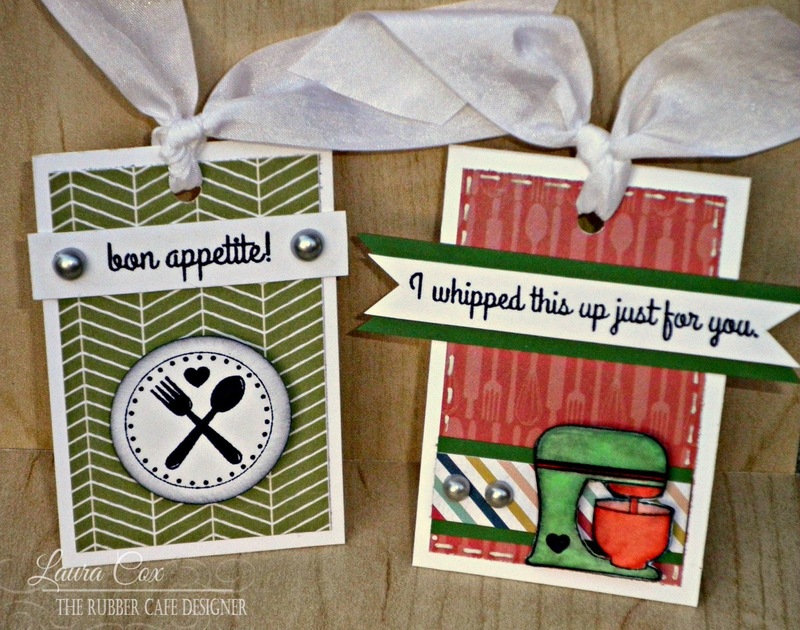 This set of tags could be a gift in a pretty box, or just a sweet addition to a holiday treat gift. Start with a 3" by 2" white cardstock base. Add a 2&3/4" by 1&3/4" piece of green pattern paper to base, glue with Scrap Happy Glue. Stamp utensils in Black Tuxedo Memento Ink, and punch out with a 1&1/4" circle punch. Add Black Soot Distress Ink to edges if desired. foam tape to tag. Stamp sentiment in Black Tuxedo, trim to 1/2" by 2&1/8". Glue near top of tag, add pearls. Punch hole and add ribbon. Start with a 3" by 2" white cardstock base. Add a 2&3/4" by 1&3/4" piece of gold paper to base, glue with Scrap Happy Glue, add stitched border with white gel pen. Stamp utensils on white cardstock using Pumice Stone Distress Ink, stamp sentiment on top with Black Tuxedo Memento Ink, trim to about 1&3/4" by 1&1/4" and mat on a 1&7/8" by 1&3/8" piece of blue swiss dot cardstock. Add a 1/2" banner of striped pattern paper, foam tape utensil piece to bottom right corner, and add pearl and ribbon. Start with a 3" by 2" white cardstock base. 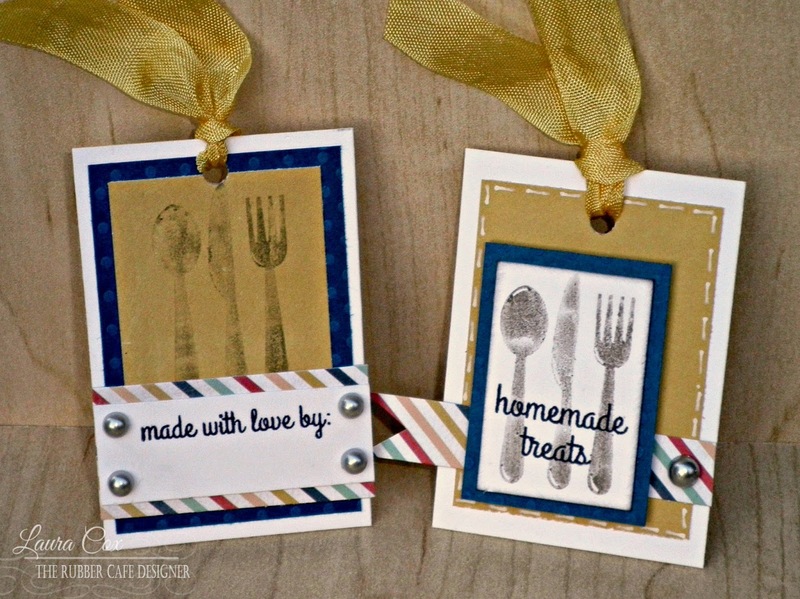 Add a 2&3/4" by 1&3/4" piece of blue swiss dot cardstock, glue with Scrap Happy Glue. 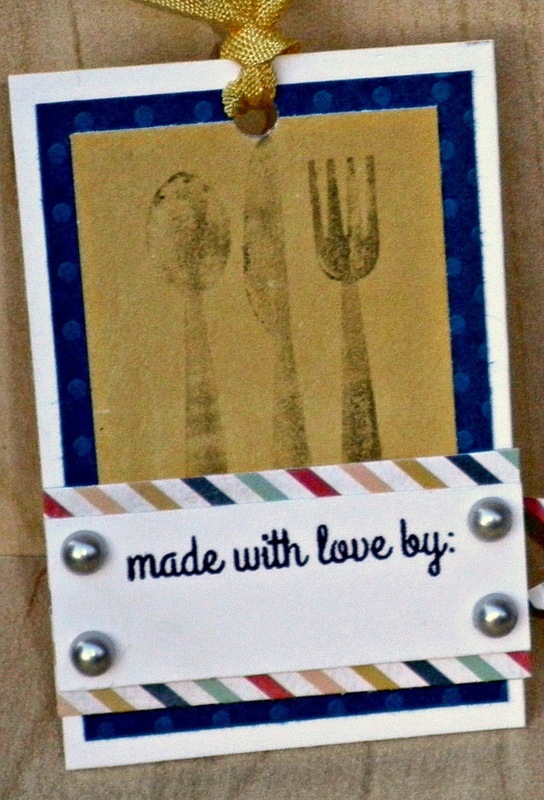 Stamp utensils on 2&1/2" by 1&1/2" piece of gold paper with Pumice Stone Distress Ink (lightly to give a worn/distressed look), glue to blue swiss dot. 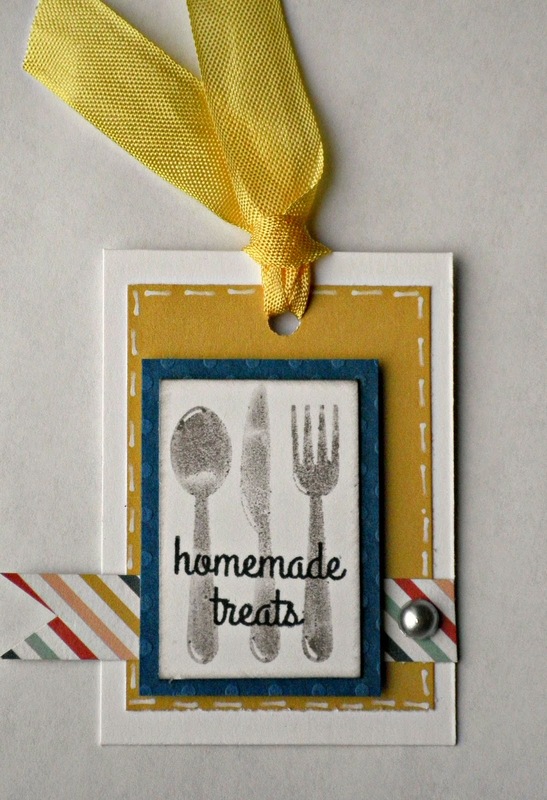 Add a 1" by 2" piece of striped pattern paper near bottom of tag. Stamp sentiment in Black Tuxedo Ink on white cardstock, trim to 3/4" by 2" and add to tag. Add pearls and ribbon. Start with a 3" by 2" white cardstock base. Add a 2&3/4" by 1&3/4" piece of utensil pattern paper, glue with Scrap Happy Glue and add stitching with white gel pen. 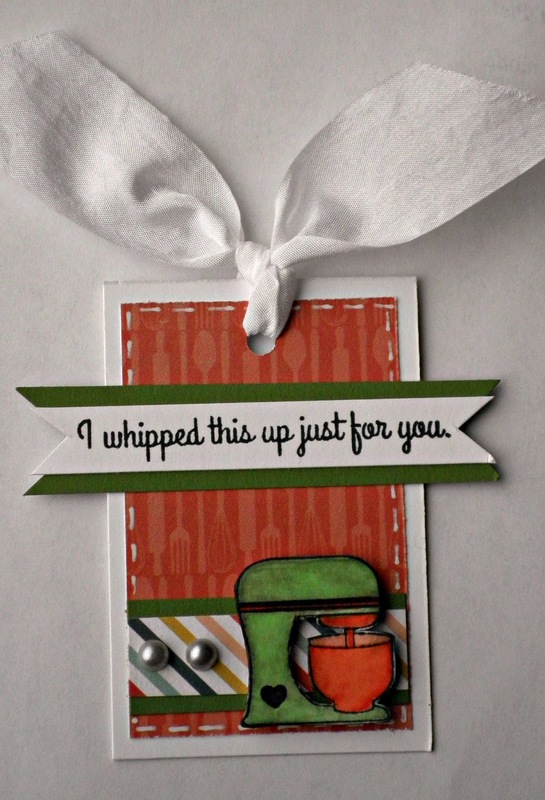 Stamp mixer and sentiment on white cardstock in Black Tuxedo Ink. 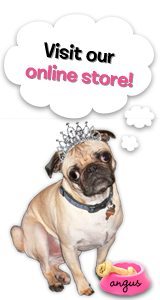 Trim sentiment down, creating banner, mat with olive green cardstock and glue near top of tag. Color blender with Copic Markers and fussy cut out. 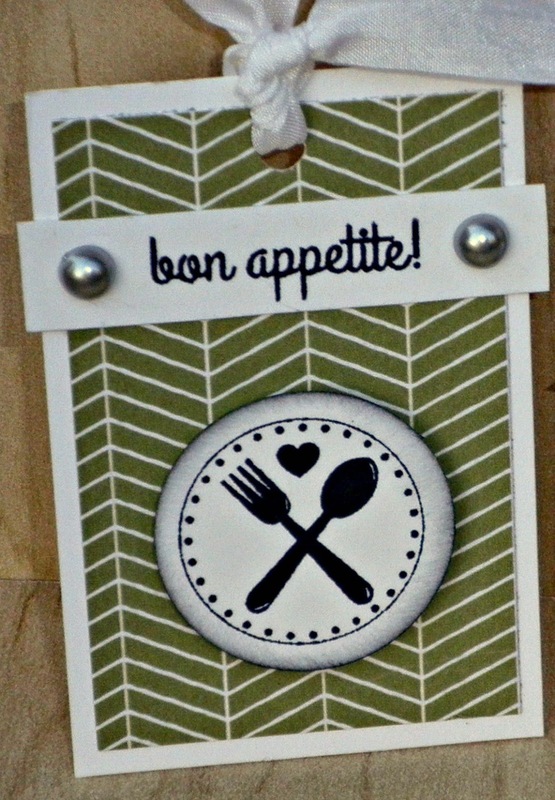 Add a 1&3/4" by 3/4" strip of olive green cardstock near tag bottom, add a 1&3/4" by 1/2" strip of striped pattern paper. Foam tape mixer, add pearls and ribbon. pearls, seam binding, white gel pen.